“Rare earths” are 17 chemical elements with awkward names and unusual properties. Their atomic numbers are 57–71, 21, and 39. Their two subfamilies, one scarcer and hence more valuable than the other, have similar chemistries, so they’re generally found and mined together. Despite their name, rare earths are not geologically rare but are widely dispersed throughout the Earth’s crust. They are mined in few places and by few firms, though, because they tend not to occur in highly concentrated form. Further raising miners’ costs and risks, the world market for rare earths is modest (several billion dollars a year), volatile, complex, and dominated by China, where not all mines and exports are legal and transparent. One expert concluded that about half of 2015 global production was off the books. Rare earths’ uses are highly specialized but diverse. These elements are used in mobile phones, superstrong magnets and hence advanced motors and generators, some oil-refinery catalysts, certain lasers and fluorescent-lamp or flat-screen phosphors, some batteries and superconductors, and other technologies important to modern life. Some rare earths are particularly useful in energy applications. Around 2010, some articles and commentators warned that shortages of rare earths, or China’s near-monopoly on them, could choke off the West’s shift to renewable energy and other clean technologies. This was never true—but the myth persists. Bubble and burst. Rare earths concerned only specialists until about 2009–10. In the mid-1990s, China had consolidated its control over most of the global rare-earth market, and the last US mine and mill, once the world’s dominant producer, closed in 2002 because it was unprofitable. China began imposing export quotas in 2006, and limited exports to Japan (a major user of rare earths for high-tech miniature motors) during a diplomatic spat in 2009–10, so global prices and anxieties soared. US government agencies published urgent reports about the rare-earth crisis and its threat to national security. Could China’s control of these crucial elements—roughly 97 percent at the time—block Washington’s ability to produce Tomahawk missiles, F-35 jets, and night-vision goggles, as some military writers warned, never mind electric vehicles and wind-power turbines? As a technologist who had advised major mining companies, written two books on metal mining and a 445-page text on efficient motor systems, done rare-earth physics experiments at MIT Lincoln Laboratory, and consulted for MIT’s Francis Bitter Magnet Laboratory, I knew enough to be unconvinced by rare-earth alarm bells. It all felt like a commodity bubble, based more on a shortage of understanding—of rare earths, economic geology, and resource efficiency and substitution—than on a shortage of rare earths. Sure enough, the debate was heavy on the supply of rare earths but light and often misinformed on the demand side. The few observers who focused more on demand suspected that rare earths’ price spike wouldn’t last long, whether or not it reflected mining-stock hype. I called the coming crash, to general ridicule, in 2010. Rare-earth prices soared through spring 2011—when a rare-earth bonanza was fondly predicted for Helmand Province in Afghanistan—but then plummeted. US supplier Molycorp reopened its California rare-earth mine in 2012, but went broke in 2015 when low world prices wouldn’t support its high costs. By 2015, MIT Technology Review asked, “What Happened to the Rare-Earths Crisis?” It misleadingly called rare earths “crucial to the permanent magnets used in wind turbines and motors in hybrid or electric cars,” and concluded that worries about them had “seemingly dissipated without much fanfare” as “demand fell more than expected,” but never connected the dots by asking why demand did that. By 2016–17, the market was in the doldrums, with China planning to limit annual production to 140,000 metric tons beginning in 2020 to try to raise prices again. 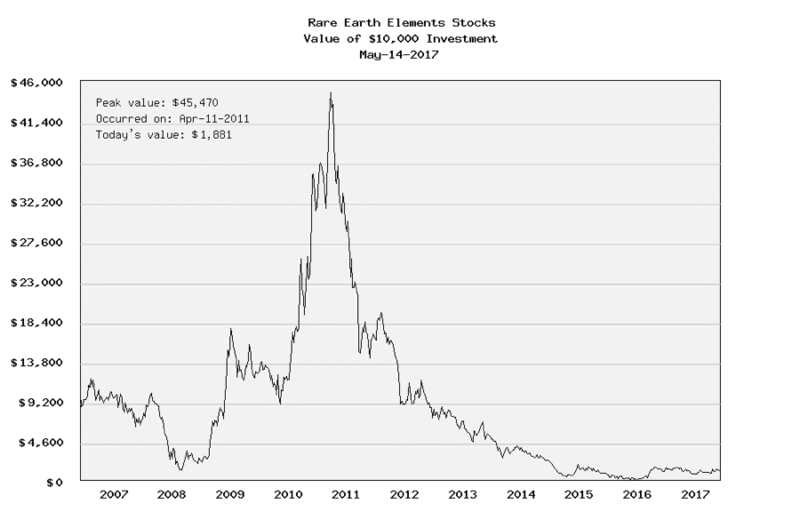 An investor in the rare-earth industry in 2007 would have lost 81 percent of her portfolio value after a classic decade-long boom-and-bust wild ride (see the chart at the top of this article from buyupside.com). This is not how a durably scarce and valuable commodity behaves. What happened? Just what you’d expect of a thin market influenced by ignorance but ultimately tamed by reality. When prices soared, stockpiles rose, idle mines reopened, explorers sought and found new deposits, and recycling increased (for example, cerium in glass polishing). Most important, as customers from General Electric to Toyota to Ford sought to cut costs and boost performance, the costlier materials were used more frugally and often replaced with cheaper, better solutions—all as I’d predicted in 2010. Prices fell accordingly. Efficiency and substitution. To dig a little deeper, let’s start with supermagnets. Neodymium is a rare-earth element roughly as abundant in the Earth’s crust as lead or chromium, though far less likely to concentrate in high-grade ores. In 1982, General Motors and Sumitomo discovered that compounding one-fourth neodymium by weight with three-fourths iron and boron could make the most powerful family of supermagnets then known, typically Nd2Fe14B, and that these magnets’ properties could be further improved by adding traces of other rare earths—praseodymium plus either dysprosium or costlier terbium. (See why only specialists know this stuff?) China, having lots of all these elements and preferring value-added to raw-material exports, built up a supermagnet industry whose low prices took over most of the world market and shuttered competitors. China also vigorously pursued research and development to find further uses for its rare-earth bounty. Even in 2015, China accounted for more than 80 percent of global rare-earth production but also for about 70 percent of rare-earth demand—not an unreasonable balance. Around 2010, many commentators stridently warned that China’s near-monopoly on supermagnet rare-earth elements could make the growing global shift to electric cars and wind turbines impossible—because their motors and generators, respectively, supposedly required supermagnets and hence rare earths. Some such reports persist even in 2017. But they’re nonsense. Everything that such permanent-magnet rotating machines do can also be done as well or better by two other kinds of motors that have no magnets but instead apply modern control software and power electronics made of silicon, the most abundant solid element on Earth. The first kind is the induction motor, invented by Nikola Tesla 130 years ago and used in every Tesla electric car today. The second kind, less well-known despite origins tracing back to 1842, is the switched reluctance (SR) machine, likewise made of just iron and (less) copper, but using a different geometry and operating principle. If well-designed, which many are not, SR motors are simpler than permanent-magnet motors, more rugged (so they’re widely used, ironically, in mining equipment), more easily maintained, and equally light and compact. They can switch in milliseconds between serving as a motor or as a generator, and spinning in either direction. They’re also more flexibly controllable, more heat-tolerant, and cheaper for the same torque and production volume. The only scarce resources associated with such capable SR machines are familiarity, which few motor experts have, and skill in their more-difficult design—especially at the level achieved by the UK firm SR Drives (bought first by the US firm Emerson Electric, then by Japan’s Nidec). Both kinds of magnet-free machines can do everything required not only in electric cars but also in wind turbines, functions often claimed to be impossible without tons of neodymium. That some wind turbines and manufacturers use rare-earth permanent-magnet generators does not mean others must. It’s better not to, and the word is spreading. Similarly, the red phosphors in compact fluorescent lamps traditionally used europium. But those lamps have now been largely displaced by white LEDs that use about 96 percent less europium. Moreover, new red phosphors use no rare earths, while the latest green phosphor cuts terbium use by more than 90 percent. Erbium in fiber-optic repeaters—another small-quantity, high-value use of rare earths—looks at first glance harder to substitute. But very little erbium is needed, and fiber capacity must compete with today’s bandwidth-enhancing, multiplexing, and wireless innovations. Some hybrid cars, like my 2001 Honda Insight, used nickel-metal-hydride batteries containing lanthanum, but those are now largely replaced by lighter lithium batteries, which typically use no lanthanum. (Both kinds of batteries are also recyclable, and infrastructure for recycling is emerging.) Tesla’s market-leading lithium batteries, like its motors, use no rare earths at all. Non-lithium batteries and potent potential substitutes for batteries (notably graphene ultracapacitors) are also emerging. Moreover, all electric cars need two to three times fewer batteries if we take obesity—weight and drag—out of their design, especially by replacing heavy steel with light metals or with even lighter (but stronger) carbon-fiber composites.The carbon-fiber passenger compartment in my BMW i3 is an impressive early illustration; its carbon fiber is paid for by needing fewer batteries. Newly commercialized manufacturing methods can produce such carbon-fiber structures at automotive speed and cost. Applied throughout US automaking, such ultralighting (plus better aerodynamics and tires) could save half as much oil as OPEC produces, or about one and one-half times as much as Saudi Arabia produces. The cost of achieving these savings would be below $10 per saved barrel—or about one-fifth of the world’s mid-2017 oil price. Thus the most effective substitute for rare earths, in both motors and batteries, isn’t another exotic material for making motors or batteries; it’s smarter car design that makes motors smaller and batteries fewer. Or, even better, it could be new business models—shareable services like Zipcar and GetAround, mobility-as-a-service operations like Lyft and Uber, or autonomous vehicles—that carry more people more miles in far fewer cars at astonishingly lower cost, ultimately saving on the order of $10 trillion worldwide (in net present value). Such examples illustrate the processes of resource efficiency and substitution (processes that extend far beyond rare earths). Scarcity, real or perceived, drives price, attention, R&D, and imagination. It elicits mineral exploration: At the market’s 2011 peak, some 190 companies were scouring the planet for potentially profitable rare-earth deposits. Scarcity makes end-uses more productive, durable, and closed-cycle, with recycling no longer an afterthought but a business imperative. It even drives the kind of basic research that in the United States (largely through the government agency ARPA-E) and in Japan has lately come up with even more powerful supermagnets based on iron nitride (Fe16N2) and containing no rare earths whatsoever. Sorry, China. Remember when the 1973 and 1979 oil-price shocks triggered the development of mobility alternatives that are now coming to market and threatening to smother oil demand? The 2010-era rare-earth price spike set similarly subtle but irresistible forces in motion that will make sustained high rare-earth prices unsupportable. Sloppy analysis. Together, these shifts in economic geology, resource use, and innovation are extremely powerful. This isn’t to say that no rare-earth issues remain: Price instability, for example, remains a long-term concern if greater efforts to supply the more-valuable “heavy” subfamily of rare earths co-produce too many less-valuable “light” ones. But serious concern about rare earths still lacks an informed basis in either scarcity or oligopoly. Only the echoes of less-informed prior concerns reverberate. David Abraham’s 2015 scarce-metals book The Elements of Power is well written, contains astute observations about mining complexities and market structures, and makes many sound policy suggestions. Yet Abraham’s focus on the scarcity story slights his discussion of substitution—which, if properly developed, would have largely invalidated the concerns in the previous 10 chapters. Such scarcity-centric treatments have unfortunately reinforced a morphing of rare-earth concerns, and of some soberly targeted government research, into a commercial lobbying effort meant to scare us about scarcities of strategic metals, presumably in the hope of eliciting more subsidies to mine them (which was Congress’s first reflex in 2010). Sloppy analysis is often the culprit. Even the relatively careful Abraham describes titanium as a “rare” metal (p. 221); it’s the fourth-most abundant metal in the Earth’s crust. Some writers claim that lithium, a light metal occasionally confused with rare earths by novices, is too scarce to support a big electric-car industry—a surprise to firms with vast lithium deposits in diverse countries. A writer on a normally well-informed website worries about platinum supplies for fuel cells, failing to notice that Los Alamos National Laboratory has already cut the needed amount by tenfold, and that fuel-cell cars won’t need the catalytic converters that now tie up far more platinum. Economics ultimately follows physics. When I was a young Oxford don around 1970, I visited London’s Royal School of Mines, where my simple little introduction to metal mining was being used as a freshman text. To my astonishment, a senior professor said he’d found that the London Metal Exchange price of every nonmonetary metal, smoothed over a decade or so, could be predicted within a factor of about three—despite the metals’ enormous ranges in price and crustal abundance—from three purely physical variables. These were the grade of typical ore (that is, the ore’s concentration of the desired metal), how finely that ore must be crushed to expose a face of the ore mineral in each grain so it could be concentrated, and how much energy was needed to smelt the metal out of that mineral. Those physical variables were surrogates for the required investment and energy. 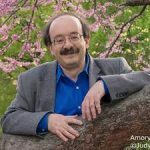 With an important caveat—I don’t know how his analysis (regrettably unpublished) handled crucial details of metals produced as by-products or co-products of each other, which greatly complicate market behavior—the professor’s analysis of physical properties’ power to predict metal prices was an extraordinary tribute to the long-run efficiency of metal markets. It also adds a cautionary note to any claim that a particular element is scarce. Scarcity tends ultimately to be self-correcting through price. That’s what markets do through supply and demand—they find balance at a market-clearing price. Rare earths do merit measured expert attention, as with any special ingredient in important processes and products—cobalt or gallium, indium or phosphorus. But rare earths are very unlikely to shift the world’s strategic balance or create resource crises, as many investment enthusiasts breathlessly claimed in 2010, months before losing their shirts. Just as Saudi Arabia’s rulers are discovering that they cannot control world oil markets, and Russia’s President Putin may be starting to realize that his struggling economy’s hydrocarbons don’t confer the decisive geopolitical advantage he’d hoped, Chinese policy makers have doubtless learned, perhaps better than some of their customers, that rare earths are simply another commodity—unusual, significant, but unable to transcend the realities of economics, innovation, and trade.